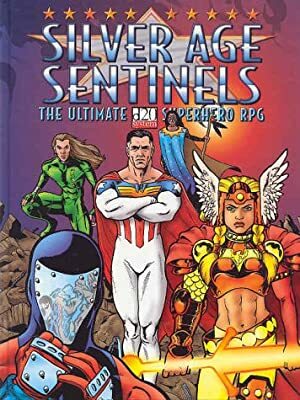 Silver Age Sentinels was a super-hero Role-Playing Game published in 2002. It did not survive the demise of its publisher, Guardians of Order, in 2006. Like most super-hero RPGs, it came with a cast of characters. Several of those have profiles on writeups.org. Among the lot, Caliburn is sort of, kind of an analogue to Batman. Known Relatives: Jennifer Randall (fiancée, deceased). Base Of Operations: Empire State Building, Empire City. Height: 6’1” Weight: 250 lbs. Caliburn is a top-shelf martial arts and stealth specialist, with various detective and B&E abilities. He’s also a crack archaeologist. Adam Sinclair was the child of a rather well-off family. However, his father died when he was 10. His mother was then bedridden due to a cancer. Thus he had to share his time between caring for her and school. His solace was reading and dreaming about Arthurian knights. When his mother died, both were freed. He went on, with high grades, to become an archaeology student at Oxford. He was also an excellent fencer and rugby player. During fencing matches met Jennifer Randall, a young detective at Scotland Yard. They were engaged while Sinclair continued to work on his doctorate. His life’s dream was finding evidence demonstrating that Arthur was real. While Jennifer was clashing with an extremely dangerous serial killer (Zachary King, a wealthy dilettante), Sinclair experienced odd dreams. One morning woke up in a mist-shrouded forest near a lake. A fleeting encounter with the Lady of the Lake cleared his mind and focused his purpose. He awoke determined to find justice not in the past, but in the present. Randall has been badly wounded by King, but Sinclair became her silent assistant. He hunted down Janus, and took down other criminals when she couldn’t legally do so. Sinclair took the name and costume of Caliburn – another name for Excalibur. He even managed to apprehend King (now known as Janus, a hunter of heroes) after he murdered the hero Wrath. Caliburn became a staunch ally of Scotland Yard and a role-model for younger heroes. Janus eventually escaped. They had numerous confrontations, and in the end Janus snapped and threw aside all rules. He murdered Jennifer, then disfigured Caliburn with a red-hot poker. 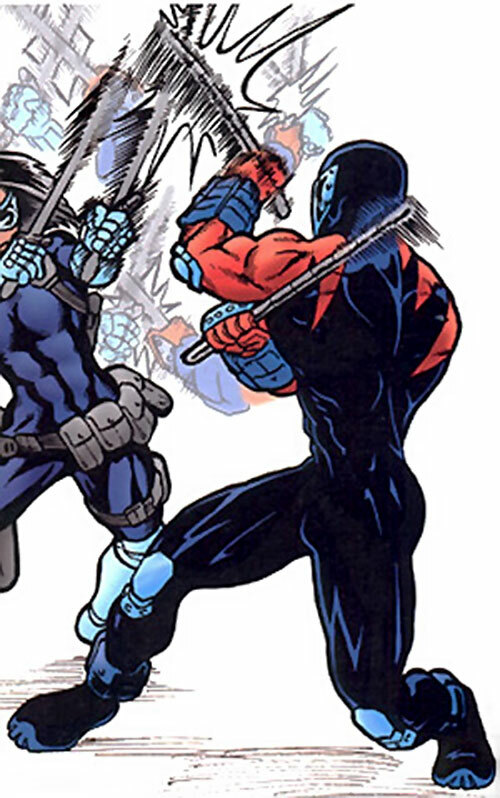 Caliburn retreated to bandage his wounds and change his mask into something that could protect his face against most assaults, and took down Janus. He did not kill him and let the detectives lock him away. The memories of London were too painful and Caliburn left Britain to join the premier super-heroes team in Empire City, the Guard. Professional, experienced, hard-working hero. He’s serious and quiet but very sharp. The UK is not highly populated with supers in the DCU. So there’s little problem with a London-operating Caliburn. Detect (lies) is a Skilled Power and has a Range of 02. Jumping is a Skilled Power. Area Knowledge (Empire City, London), Language (French, Gaelic, Latin, Welsh), Lightning Reflexes, Scholar (Archaeology), Slowed Ageing. Guard (High), ECPD (Low), Scotland Yard (High). Collapsible batons (x2) [BODY 10, EV 03 (06 w/STR, 10 w/Martial artist)]. Grenades (x6) [Generally include smoke, flash-bang, flash and concussion). By Sébastien Andrivet (DCH adaptation). Source of Character: Silver Age Sentinels RPG. Helper(s): Roy Cowan, Pawsplay (stats recalibration).